Of everything on the Middle East leg of my trip, the thing I was most nervous about was crossing the land border between Israel and Jordan. Looking on the internet, you will find stories of those who crossed with no issues - but then you will also find horror stories of long waits, arbitrary delays, difficult border guards, etc. The thing about the Middle East is that you never know - rules constantly change depending on the day and situation, so I was nervous about the unexpectedness of it. 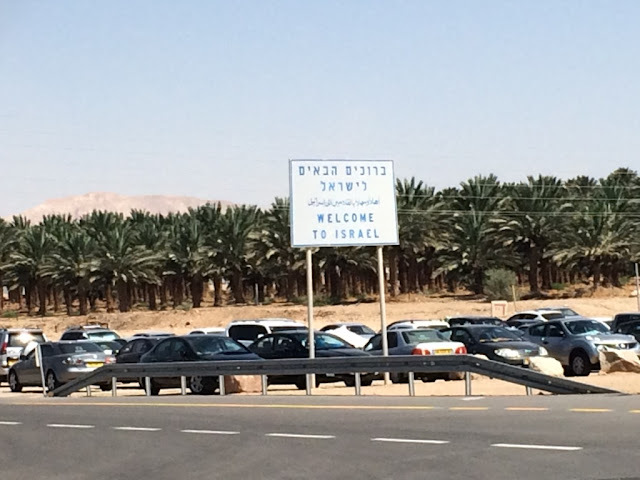 There are three land checkpoints between Israel/Jordan: the one we went through was the southernmost point called the Wadi Araba checkpoint (it's called Yitzhak Rabin on the Israeli side). This checkpoint takes you from the city of Eilat, Israel on one side, to Aqaba, Jordan on the other. From Eilat, we took a taxi to the border, which took around 10 minutes and cost 30 NIS (about $10). The taxi dropped us off right at the border. This way to the border crossing....oh and birdwatching! The border terminal opens at 6:30AM, and we'd heard there are times when you will encounter long lines (especially sometimes in the mornings with tour groups). But when we arrived around 10AM, the entire terminal was pretty empty. We walked up and an Israeli policeman checked our passports. From there, the process was pretty seamless. There are a series of windows you visit in order. 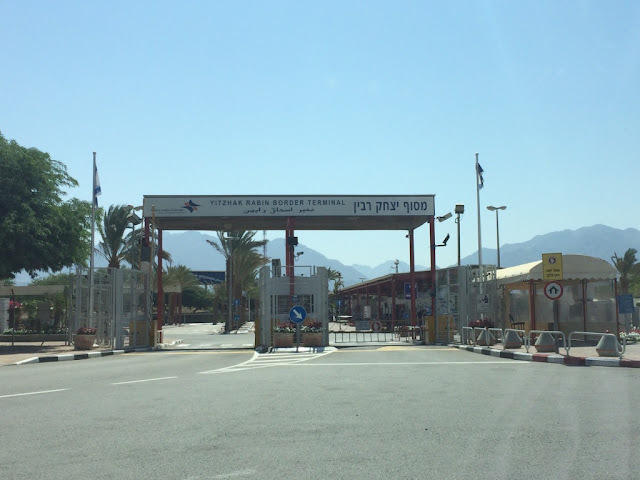 At the second window (customs), we had to pay an Israel exit fee of 104 NIS per person (about $30). At this window, the lady also gave us an option to change cash into Jordanian dinars using a debit or credit card (which you will need as soon as you exit on the other side to pay for a cab). Lastly, she stamped our passports with an exit stamp - you can request her not to do so, since an Israel stamp in your passport can prevent you from entering countries like Iran or Lebanon. I was too slow to react - that stamp came out of nowhere! Drew was not too slow, and she was fine stamping a receipt for him instead of his passport. Then they make you walk through a duty-free store - just a small one, but there are signs everywhere telling you this is your last chance to shop before entering Jordan. We used every last penny of our NIS on water and a pack of Twix (the cheapest item in the entire store). 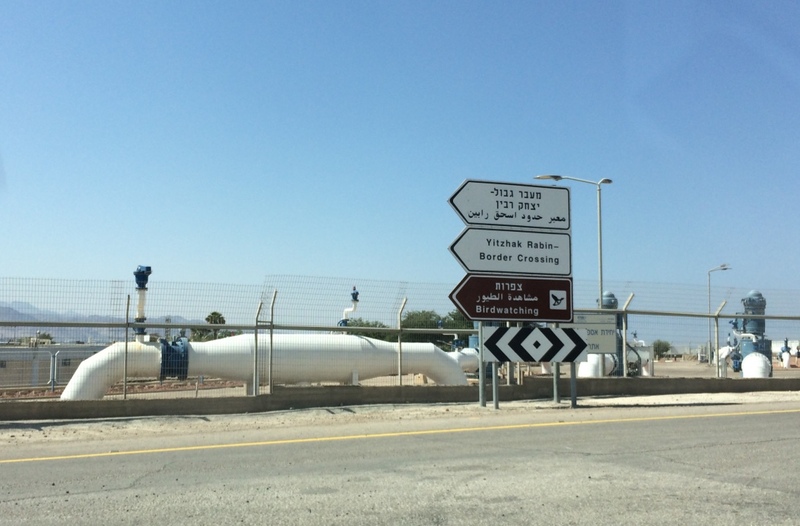 After you exit the duty-free store, you approach the no-man's land between Israel and Jordan. 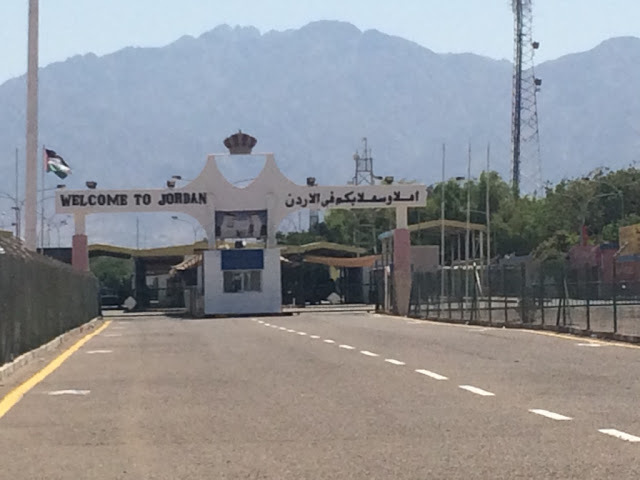 As you enter Jordan, another passport check. Then a security scan, where they screen your bags and belongings. The guards started off a little tough with us by demanding we open our bags and show them everything inside after they'd gone through the scanner. However, in the midst of opening Drew's bag, they started a conversation with us about the NBA and their their demeanors got lighter as they were talking about how much they love the Lakers (yuck why). Both guards started chattering away and seemed to forget they hadn't opened my bag yet, so we took advantage of the situation by smiling at them, nodding a lot, and picking up our bags and scooting out of the room. Thank goodness they didn't get into my bag - it was stuffed to the brim and was probably one of those situations where once they started taking things out, I'm not sure it all would have fit back in. More windows. We got our passports checked a couple more times, a couple questions about why we were entering Jordan, and entry stamps/visas stamped into our passports. As my passport had already been stamped by Israel, I didn't care what was stamped into it afterwards, so all was good with me. However, Drew asked the guard not to stamp his again (because even if you don't have an Israel stamp, if you have a Jordan stamp in your passport showing you entered Jordan by land, customs can deduce you were in Israel beforehand). This time however, the guard refused and stamped his passport anyways. Whomp whomp. However, I'm not sure if this was due to a miscommunication, because I've heard of people being able to make it through this border crossing completely stamp-free. 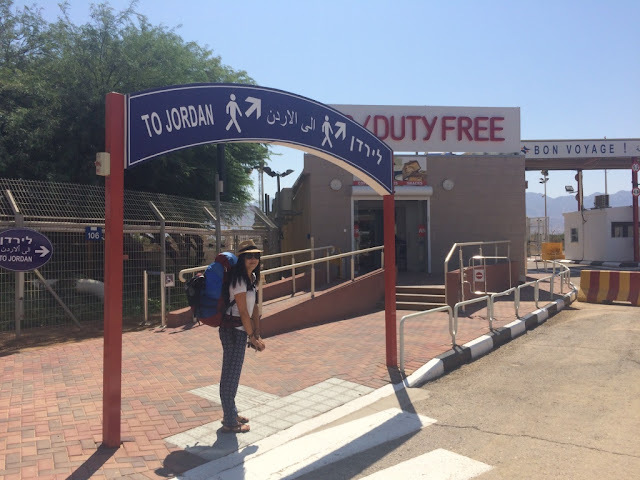 Typically there is an Jordan entry visa fee of around 40 Jordanian dinars (~$57) - but somehow we were not charged. I don't know if someone forgot to charge us. Oh well. Upon exiting the terminal on the Jordan side, there is no public transport or anything - just a group of taxis. It is known in traveling circles as the "taxi mafia", as they basically have complete control over how much to charge you since you have no other options. You can take a cab into the nearby town of Aqaba, but we were heading to Petra (about 2-3 hours away) - so we hired a cab to take us all the way there. It is very taxi mafia-feeling - there was a sketchy man who was seemingly in charge and ordered the drivers about and had us move our bags from one car to another. The second car he moved us to, I saw the driver had to pay this guy some money. It was not the most comforting feeling, but at the end of the day, we got to where we needed to go, and at a price we saw was fairly comparable to what we researched beforehand (about 50 dinars, or $71) to go all the way to Petra. All in all, the entire border crossing process took around 30 minutes for us. 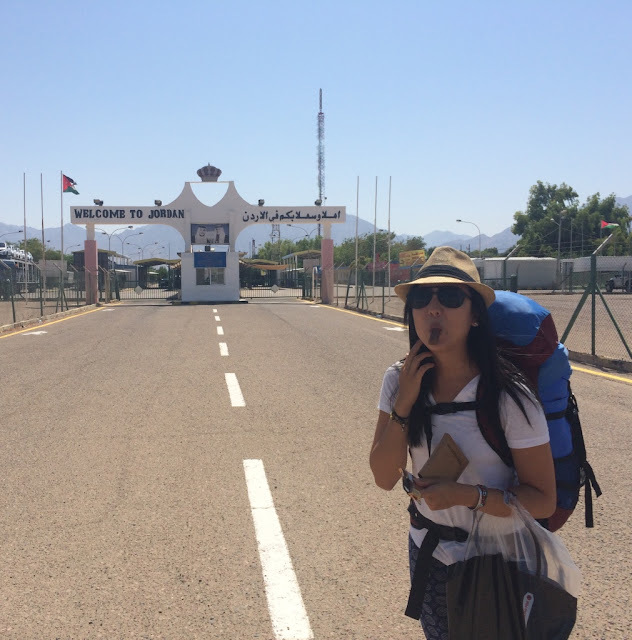 We've heard horror stories of some crossings taking hours and hours, or interrogations and such - so overall, I think we got pretty lucky and our experience was almost completely seamless (save for the tiny passport stamp fiasco. I hope I don't have a pressing need to go to Iran or Lebanon anytime soon). Beforehand, it was surprisingly hard finding complete, thorough information on the entire process online (or information that wasn't a couple years old anyway) - so hopefully this might be slightly helpful to someone, somewhere. Even if not, it was an incredibly interesting process that I'm glad I got a chance to do and wanted to detail.